THE BIG, JUICY, GMCJAM ZIP (710MB)!!!! So. it's the Halloween time of year and that means pumpkins, bats, annoying kids at the door and.... Great GMCJam #12!!! Time to create a 72hour GameMaker masterpiece with which to scare away all the opposition and win the approval (or not!) of our peers. This time around the Jam will run from Saturday 26th of October through Monday 28th and will be 72 hours dedicated purely to game development. Are you ready? The Jam is a community event that we organise to encourage people to experiment with GM and make something that will be interesting or entertaining within the limited timescale of 72 hours. Using the theme is NOT obligatory, nor is using the handicap, but using either will be valued when voting and using BOTH gets extra Kudos! To encourage use of theme, the highest-voted theme-based game gets to choose the theme for next Jam. The theme will not be revealed until just before the start of the Jam to prevent any advantages. All games are eligible (themed and non-themed and with or without handicap), but voters should take "use of theme" into account. Remember: non-theme games can win, but they CANNOT pick the next Jam's theme (see above). Voters choose 1st, 2nd and 3rd place as well as three special votes to "Best use of theme", "Best Presentation", and the "Best Devblog". It is OBLIGATORY that when voting you leave feedback about WHY you voted for the game(s) you chose, even if it's only a few lines to say you loved the game idea or whatever. Failure to do so may result in your votes being removed. It is NOT obligatory to play nor review all the games! Honestly, when dealing with so many games, it is a difficult and sometimes daunting task to play through all of them and then vote. So don't do it! Play as many as you feel comfortable with and then vote for which of those that you liked, leaving comments and feedback where possible. Don't worry, the SSE voting system that we use will compensate. If everyone does this then all games WILL get played, and have feedback, which is what this is all about, and I'd prefer to see 5 quality reviews accompanied by five votes to 60 votes and no reviews. In order to encourage friendly community spirit, we ask that members not vote for their own game and please refrain from asking friends/family to do so if they are not part of this community. This has happened before and if you are found out your game may be removed from the Jam. Any form of cheating will result in the instant removal of your game from the jam and being blacklisted for all further community events. You may submit as many games as you wish, but only the highest rated game in the final vote will be eligible for winning any prizes. Games must be posted in the Official Games Topic before the finish deadline for the Jam, and posting a topic in the Games (or WIP) forum here at the GMC is recommended if you want feedback and opinions as the Games Topic is ONLY FOR POSTING GAMES. Hosting is up to the individual user. You may also include and update a development log in your official games topic post. The Official Games Topic must contain a link to your game and a short description. HTML5 Games are permitted, BUT MUST HAVE DIRECT LINK TO DOWNLOADABLE .EXE VERSION posted in the Official Games Topic. People are welcome to use any outside sites, and are also welcome to promote such sites, but the posting of topics and the voting will be done on the GMC. The Community Prize will be as before... A special graphic/banner, bragging rights and (if your game is a themed game) the possibility of choosing the next jam theme. Prizes will also be offered as members of the community contribute whatever the feel appropriate. EG: Coverage on their web site, custom graphics for the game, a video of the gameplay for YouTube...anything! These are prizes kindly and very generously offered to us by GMC members. Donate your time/experience/whatever to this community endeavor! If you wish to add a community prize (game reviews, advertising etc...) please send a PM to NAL or Dangerous_Dave and they will add it to this post. PLEASE DO NOT POST YOUR COMMUNITY PRIZE IN THIS TOPIC AS WE MAY NOT SEE IT! Try not to let all of the prizes dominate 1st, 2nd, and 3rd place (but please do not reward last place!). You may choose who gets your prize including: competitors, reviewers, winners of specific categories, or even the best development log! GameDevDan : He is offering a FULL MASTER EDITION LICENSE to the over-all winner of the Jam (this license is his own from win big and not from YoYo Games). @Alex@: Offers promo codes for his games (list available here) to the top three placings of the Jam. NAL: All valid game entrants, and anyone that reviews all of the entries during the game period, will receive my Mega Font Pack 1 free of charge (including commercial usage rights). Sold at £59.99. Please contact me once you've met either or both criteria for a link to the download. True Valhalla: Top 3 overall winners receive a copy of his book Making Money With HTML5. newkill: $20 worth of Steam game(s) as a gift to the 5th place (if there is more than one person placing 5th, he picks the next unique lower place). Noel_Abercrombie: 4th place wins Steam keys for Bastion and FTL. 8th place wins a Steam key for Bastion. Yal: Top 3 overall winners will be offered the chance to appear as the boss of a secret stage in Shattered Whirr (using a giant robot of some sort), and last place as a common enemy in the same stage. Shadowrend: Artwork (poster) for the 1st place game (or any other game of theirs), and the first, second and third place will get exclusive access to his Point and Click engine before it comes out, when it is in a working state. grimdaze: I have a prize for the GMC Jam 12. It's The Fallout Collection from Steam. It includes Fallout, Fallout 2 and Fallout Tactics. I would like to give this to the first top winner that claims it. Meaning I will contact the participants starting at the first place and go down the list until someone claims it. darkwalker247: I will make a mod for Touhou Project 10 - Mountain of Faith themed on the 9th place game, and I will put it up for download on the internet as an advertisement. MishMash: Programmer looking for an artist or another programmer. Would quite like to go 3D this jam. Please add a support banner to your forum signature. Edited by Nocturne, 30 October 2013 - 09:50 AM. YAAY! I'm super excited to start Jamming! @Nocturne Are you sure about the dates? Damn... Wouldn't be the Jam if I didn't f*ck them up, would it...? I guess 27th will be great! is there anything new in the rules? Have more fun than usually? does that count as a rule? Awwww yeah. Can't wait for this. Basically winner gets a load of free food and drink from the others. And the loser gets dumped on constantly (not literally). LET THE YOYOHOUSE BATTLE, COMMENCE! First prize from GameDevDan, and it's a great one! GameDevDan : He is offering a FULL MASTER EDITION LICENCE to the over-all winner of the Jam (this licence is his own and not from YoYo Games). Looking forward to another Jam, as always I'm hoping to enter. I'm feeling inclined to try something I've not done before and see how it ends up. Should be a fun one! So, after I panicked and abandoned the last jam, I'm totally decided to try to reach the end this time, even if I end up making "Move the circle towards the other circle: GOTY edition"
Edited by Overloaded, 13 October 2013 - 04:33 PM. Upcoming 2D Turn-Based RPG. You can visit our website, like us on Facebook and follow us on Twitter. Check out my GM Marketplace Assets! Well I currently don't see any tests that I have for that Monday/Tuesday, so I suppose I'll be entering. What I like about this competition is that I don't have to rate every single game to do well in the rankings. Dan looks like "Oh S---! The deadline is in 3 hours?!?" NAL looks like "How the hell did I end up with these idiots?" Edited by smash ball, 13 October 2013 - 04:37 PM. My portfolio, I'm available for jobs. Looking forward to the Jam, already PM'd these prizes in but it won't do any harm to mention them here as well. We'll be offering some promo-codes for our iOS apps (listed below) to the top three entries to the GMC Jam. Yay! I most definitely wont miss this 'un. I have a few steam keys kicking around, so I'll pitch some of them into the prize pool later. Edited by land of games, 13 October 2013 - 05:13 PM. Edited by LukanSpellweaver, 28 October 2013 - 04:00 AM. Just sent over my prize list to Nocturne! Wow! That time already. I look forward to participating once again. I should have the weekend and most of Friday (in my time zone the Jam starts Friday) free, so I'll just lose a few hours Monday. Concerning community prizes, I'll probably do another LP of some of the games. Once I decide which ones, I'll PM Nocturne to get it added. I don't believe Nocturne runs that countdown. It belongs to a community member; I don't remember who. LukanSpellweaver: The top 3 winners will get a Desura game key for a free copy of his current project, Boken II (when it is released). I think the JAM starts on friday for me at 8:00 pm? I'm in the Eastern US timezone. Is that right? Starts at 7pm here in the Central timezone, so you should be right. Stocking up on energy drinks and snacks later this week! Edited by LukanSpellweaver, 13 October 2013 - 07:26 PM. But the logo is still for the last jam. Edited by LukanSpellweaver, 13 October 2013 - 07:41 PM. I'm extremely willing to participate (autumn holidays, FTW) but are we supposed to write an obligatory devlog like in other Jams? This forum has been archived. The content above may differ from my current opinion. Really? Looks fine to me. Maybe try a hard refresh or clear cache (Ctrl + F5). You don't have to, but some members offer prizes for the best devlogs and such. Edited by Shadow Link, 13 October 2013 - 07:49 PM. Oh, snap! 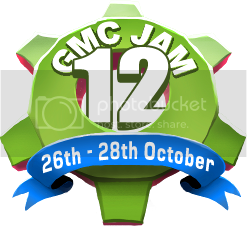 GMC Jam #12. I have no idea what kind of game to make, but I shall be entering. My goal: a completed game that works. okay, I have to enter my prizes, I'll list 'em here, then send a pm to nocturne. last place: a firm (virtual) handshake. EDIT: actually, I would like to slightly alter it. My prize pool are these 4 games. 1st place gets first choice, second place gets second choice etc. Edited by land of games, 13 October 2013 - 10:40 PM. Added a prize! Anyone that enters a valid game (ie is not disqualified from the competition), and anyone that reviews all the entries, will receive a free download to my Mega Font Pack 1 containing 90 fonts, all of which you may personally use for any commercial or non-commercial use. After what I would consider a reasonably successful first attempt at the GMC Jam last time around I'm definitely entering #12 and I'm going to bring my A game I learned a lot from Jam #11 so here's hoping that will help me. I look forward to seeing the details of the jam emerge and I look forward to trying out everyone else's games! Edited by xDJ357x, 13 October 2013 - 10:53 PM. Edited by darkwalker247, 13 October 2013 - 11:24 PM. I would love to participate in this but completely don't have the time. Maybe I'll be in the December or January one. GO NAL! Your fonts kick A$$! Edited by LukanSpellweaver, 14 October 2013 - 12:13 AM. Made myself a new signature banner for the Jam. Edited by darkwalker247, 14 October 2013 - 12:24 AM. How long does voting last? I believe it was a couple of weeks last time. Oh, and don't forget to submit cool tools and resources that you find here! That banner is bad@$$, DW! I made it in GM actually. Edit: Moved one of the light bars and improved the text animation a little. Edited by darkwalker247, 14 October 2013 - 02:05 AM. I'm hoping to have time for this. I don't think I'll be able to take Monday off this time around, but two days is still pretty good. Because of the forum being archived, the above post is probably pretty old and may not reflect my current opinion. Where is Win? How long will you be there? How many letters are there in the theme and handicap? We don't need any of them revealed, but it'd be good to at least now how many there are!